During the final Jaredite battle, the great king Coriantumr cut off the head of his opponent, Shiz.1 But “after he had smitten off the head of Shiz ... Shiz raised up on his hands and fell; and after that he had struggled for breath, he died” (Ether 15:31). A man struggling for breath without a head is hard to imagine (and most people would not want to). However, this strange event is supported by medical research. Dr. M. Gary Hadfeld, a professor of neuropathology, discovered a possible medical explanation for Shiz’s actions. He stated that “Coriantumr was obviously too exhausted to do a clean job. His stroke evidently strayed a little too high. He must have cut off Shiz’s head through the base of the skull, at the level of the midbrain.”2 If this was the case, then Shiz’s strange death scene makes sense. Hadfield noted that “the event obviously astonished both Ether and Moroni, who chronicled it.” This is likely why they both would have felt compelled to include it. Even though Moroni would have been familiar with war and the head-injuries that go with it, he still “singled out this extraordinary occurrence to include in his abridgement. Perhaps Ether and Moroni had concluded that Shiz’s last-minute ‘pushup,’ ... was due to an unconquerable spirit, an unwillingness to die.”6 Even in death, Shiz’s bloodlust knew no bounds. In addition, this uncomfortably gruesome detail, described as the “most graphic passage in scripture” reminds the reader of the brutality of war.7 Moroni chose a brutal decapitation as one of the major events to end the book of Ether with. He could have left out such an uncomfortable detail, but both Ether and Moroni chose to include it. 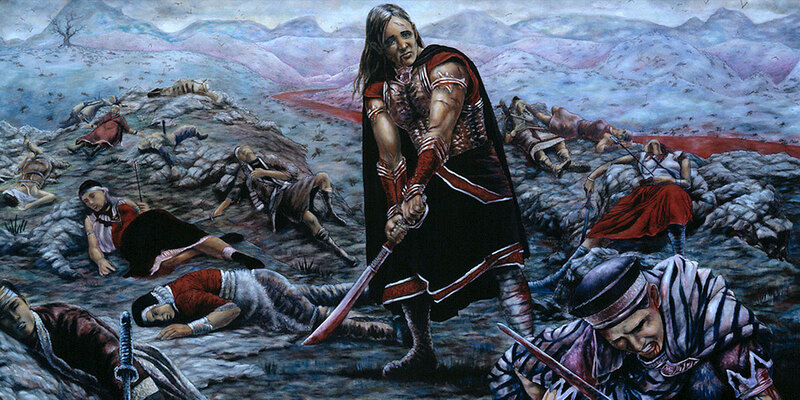 Moroni may have wanted to emphasize the brutality and hopelessness of this war. M. Gary Hadfield, “The ‘Decapitation’ of Shiz,” in Pressing Forward with the Book of Mormon: The FARMS Updates of the 1990s, ed. John W. Welch and Melvin J. Thorne (Provo UT: FARMS, 1999), 266–268. M. Gary Hadfield, “Neuropathology and the Scriptures,” BYU Studies 33, no. 2 (1993): 313–328. 1. Decapitating a captive like this would have been common in both the Ancient Near East and pre-Columbian America. See Morgan W. Tanner, “Jaredites,” Encyclopedia of Mormonism, 4 vols., ed. Daniel H. Ludlow (New York, NY: Macmillian, 1992), 2:719. 2. M. Gary Hadfield, “Neuropathology and the Scriptures” BYU Studies 33, no. 2 (1993): 325. This understanding assumes that part of the bottom of the head survived, so that Coriantumr did not “smite off” all of the head of Shiz, which some people have taken objection to. However, such a literal reading of the text is unnecessary. See Brant A. Gardner, Second Witness: Analytical and Contextual Commentary on the Book of Mormon, 6 vols. (Salt Lake City, UT: Greg Kofford Books, 2007), 6:326, including footnotes. 3. M. Gary Hadfeld, “The ‘Decapitation’ of Shiz,” in Pressing Forward with the Book of Mormon: The FARMS Updates of the 1990s, ed. John W. Welch and Melvin Thorne (Provo UT: FARMS, 1999), 266. 4. M. Gary Hadfield, “My Testimony, as an Academician, of God and of the Church of Jesus Christ of Latter-day Saints,” at Mormon Scholars Testify, April, 2010, online at mormonscholarstestify.org. 5. See C. S. Sherrington, “Decerebrate Rigidity, and Reflex Coordination of Movements,” Journal of Physiology 22 (1898): 319. 6. Hadfield, “My Testimony,” online at mormonscholarstestify.org. 7. Craig James Ostler, “Shiz,” in Book of Mormon Reference Companion, ed. Dennis L. Largey (Salt Lake City, UT: Deseret Book, 2003), 722. 8. Catherine Thomas, “A More Excellent Way (Ether 9–15),” in The Book of Mormon, Part 2: Alma 30 to Moroni, Studies in Scripture, Volume 8, ed. Kent P. Jackson (Salt Lake City, UT: Deseret Book, 1987), 279–280.